To Breathe or Not To Breathe! Air pollution and the dense smog has enveloped Gurgaon yet again this year, a phenomenon that created havoc for parents and schools last year. Reasons are diverse - cars emitting pollutants, open burning of wastes and crop residue, construction dust and all this is further elevated by little or no wind creating an air-lock. The AQI or Air Quality Index (420 for Gurgaon on Thursday morning) is a number by government agencies to indicate the air pollution level to public. The AQI considers eight pollutants namely - PM2.5, PM10, O3, NO2, SO2, CO, NH3, and Pb. The worst score on these pollutants is equal to the overall AQI. The PM or Particular Matter are tiny particles in the air, with PM2.5 being the tiniest of these all – about thirty times smaller than the thickness of a human hair. This is thus able to mobilise into the respiratory tract, getting to the lungs. Gurgaon parents echo this concern. “The lung capacity of my daughter has been reduced by living and going to school in Gurgaon. She has to endure the terrible effects of air pollution across the city year after year” said Divya Sud, parent of a six-year old that moved to Gurgaon a decade back. Air quality during the earlier part of the day when children reach school is the worst. Activities that cause exertion, like riding bikes, increase the rate of breathing and worsen the impact caused by polluted air. It is due to this hazardous air condition, the Haryana government had earlier ordered all schools to operate from 9 am to 3.30 pm till November 30, but has now instructed for schools to be shut today (Friday). A few select Gurgaon schools such as The Shri Ram School and The Heritage School had opted to stay closed from Thursday itself. Others such as Shikshantar and Shiv Nadar School had decided to suspend classes till grade 5 on Thursday. The impact though may be a bit less felt in certain schools given their building and campus design. “It is certainly a grave concern for all of us. Fortunately for us our work areas and indoor activity areas are 70% of our Campus and built below ground level. Our students are relatively more protected” felt Yasmin Khan, Principal, The Paras World School India. Quite a few parents were wary of sending kids to school. They are repeatedly asking in peer parent groups - Should we keep children at home? Should we change the tiffin menu to provide food with higher amounts of Vitamin C, E omega and other ingredients that help fight pollution? 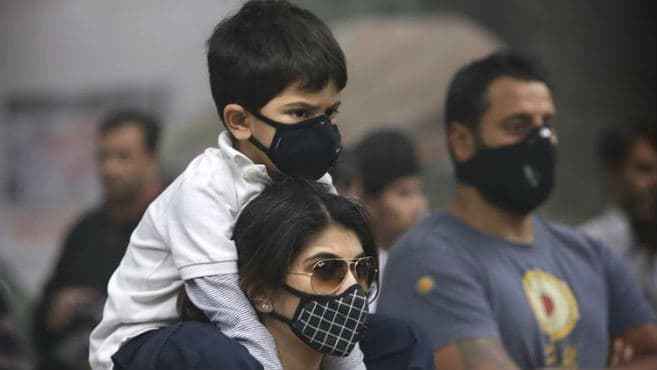 According to parents while many schools have issued advisory for children to wear masks and come to school, but masks may not be enough to deal with this menace. But not sending children to school can’t be a long term solution to a problem that reoccurs every year, not without compromising on the academic hours available to a school. While schools in the city were deciding whether to stay shut on Thursday or have suspended physical education activity at the least, schools such as GD Goenka World School, Vega Schools, Pathways Schools and Suncity School seemed less perturbed – with air purification systems in place to improve the air quality indoors. “The PM 2.5 levels outdoors are indeed at disastrous levels. Any other city in the developed world would have evacuated its citizens. Vega Schools foresaw this problem and built a centralized PM 2.5 filtration system for the children to have clean and safe air to breathe – a basic necessity I feel. Young children are far more susceptible to lifelong lung damage and we must do everything we can to protect them. We are proud to say we are probably the only school that has invested in such a system.” said Sandy Hooda, co-founder, Vega Schools. As air pollution seems to be touching epidemic level, GD Goenka World School seems to be using a multi-pronged approach. “Our air filtration system within our air conditioning ensures students and teachers get purified air at all times. Young students are kept indoors during morning hours with interesting indoor activities in lieu of outdoor sports to minimise exposure to smog and pollution. Pupils are educated about drinking plenty of water to flush out toxins and advised to eat fruits and vegetables with Vitamin A to boost immunity and such goods are consciously included in meals served in the central dining hall during the day.” said Dr. Neeta Bali, Principal, GDGWS. According to Prasan Jain, director, Pathways Schools - the schools in the hustle bustle of the main city are far more in need for such systems. “While Pathways World School Aravali is relatively much less affected than most Gurgaon Schools as it is situated on an elevated, wooded site along the foothills of Aravali amidst a lot of greenery; Pathways School Gurgaon and Pathways School Noida have put in an air purification system in the central air conditioning unit which has improved the air quality drastically indoors. Outdoor activities, however are suspended for the next few days.” he said. Parents, too, seem to appreciate the use of such air purifiers in schools. “I am in the process of getting an air purifier for my home, but until then, I am happier that my child attends school as regular as she will at least breathe safer air while indoors there.” said Vandana Verma, a health practitioner and parent of Suncity School that has such air purification systems in place. These are indeed challenging times and awareness is the key to deal with this seemingly invincible demon of air pollution. We need to obviously take corrective measures so that the environment improves. But as of now, we need to look after ourselves and those we care about smartly. So, take care and breathe easy! Poor (201–300) May cause breathing discomfort to people on prolonged exposure, and discomfort to people with heart disease. Very poor (301–400) May cause respiratory illness to the people on prolonged exposure. Effect may be more pronounced in people with lung and heart diseases. Severe (401–500) May cause respiratory impact even on healthy people, and serious health impacts on people with lung/heart disease. The health impacts may be experienced even during light physical activity.